Dingbats are one of the most overlooked sources of clip art available. They are fonts that are composed of images rather than numbers or letters. There are many beautiful dingbat fonts available on the internet for download and the best part is that most are free. Dingbats were originally applied in the print business as typographical ornaments. The images functioned as space fillers. Today dingbats are both practical and ornamental. They are used as art for bullets, logos, clip art and much more. With a little bit of technological knowledge, dingbats can be converted into digital stamps and die cut files for card making, scrap booking, and other paper crafts as well. Dingbats can be easily colorized and manipulated with graphics software such as Adobe Photoshop and Adobe Illustrator. If you do not have these you can download Inkscape and Gimp (the open source versions of the Adobe products) for free. The possibilities are endless. Even though the dingbats are often free, you must still be aware and follow copyright law. If you plan to sell anything with dingbat art make sure that they are licensed for commercial use. I have featured eleven of my favorite dingbat fonts and their download links. 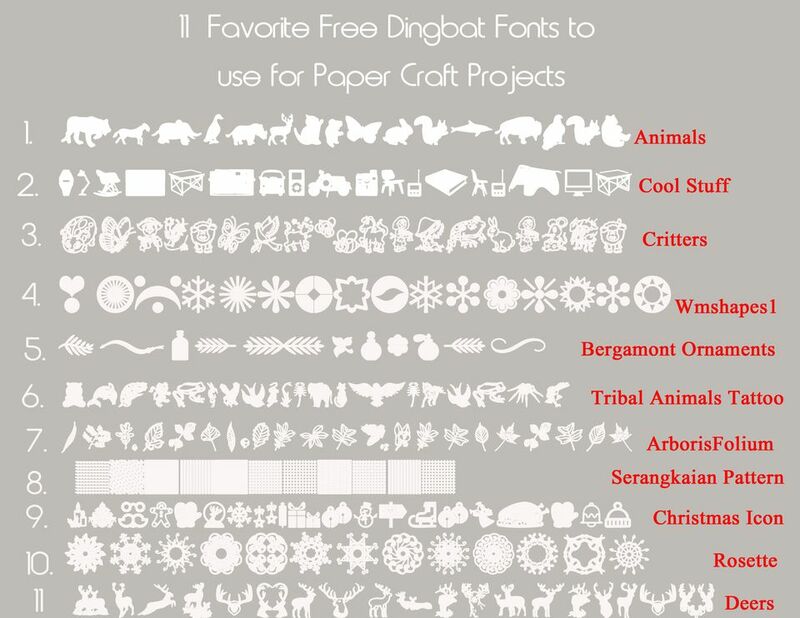 The free Animals Dingbat font features the silhouette of many types of animals.Do you need a mouse, elephant, cat, turtle, deer or rhinoceros? No problem! You can find these and many more in the Animal Dingbat font collection. The Cool Stuff Dingbat font was designed byDidik Pratikno. This font features all the products that Didik thought was "cool". You can find a bicycle, camera, mid century modern style chair and even hipster glasses in this font collection. Who could ask for more? Critters Dingbat font file is inspired by a coloring book. The designer Ozmee made this font for her grand daughters enjoyment. It features really cute animals such as a butterflies, cows, frogs and dogs. The images look like cartoons and I think these would be really nice digital stamps. They look quite similar to embellishments often seen on cards and scrapbook pages. All you would have to do is print them, color with alcohol markers and cut them out. The results would be awesome! WM Shapes1 dingbat font by WillyMac, features clean simple images such as a diamond, moon, flowers, four leaf clover and maple leaf. This dingbat would convert easily to die cut files. Scrapbookers and card makers will love this font. Remember however that WM Shapes is for personal use only! Bergamont Ornaments is a lovely Dingbat file that features ornamental scrolls, flourishes and simple words. The font is quite feminine and beautiful. The dingbat was designed by Emily Lime Design and you can see more of her work here. This version of 'Tribal Animals Tattoo Designs' is for personal use only. It was created by Jonathan Harris and features animals in the style of tattoo art. They are intricately beautiful and would look great as stamped art. This dingbat font Arboris Folium is a work of love by Andrew D. and Lise C. Taylor. It features scanned hand drawings of fall leaves and foliage. This font has 34 original drawings.It is sure to please all of the nature loving paper crafters out there! Serangkaian Pattern Dingbat Font is a wonderful pattern font that is an easy way to make digital scrapbook papers. All you have to do is enlarge and repeat the pattern in a graphics editor. Make it colorful and you are good to go! Christmas dingbats come in really handy for Christmas cards and Christmas crafts. They can help make your Christmas crafts awesome when accessorized with images from this dingbat font. The font was designed by Woodcutter. The Rosette Dingbat Font features several flower like images.This dingbat would be great as printed clip art. The font was designed by Agas Silva. Deer clip art is really popular right now. This dingbat font has several deer images that are on trend with popular card crafts and wall decor. The font also works well with Christmas crafting.